It's hard to chose pictures to start the section of this album on big kids and little kids: there's a lot of choice. The most striking quality of this blended family is the degree of complicity and intimacy between the older children and the younger children, at least before the older children's principal interest became life outside the home as their teenage years advanced. From the moment that Charles was born, in August 1995, and the other children crystallized a kind of cocoon with him and around him, the energy (not forgetting the spats) among the children has been a source of constant inspiration (not forgetting fatigue, respectively!). The best parts of all of the older children come out with the little ones, and Charlie and Alex have a particularly good life. 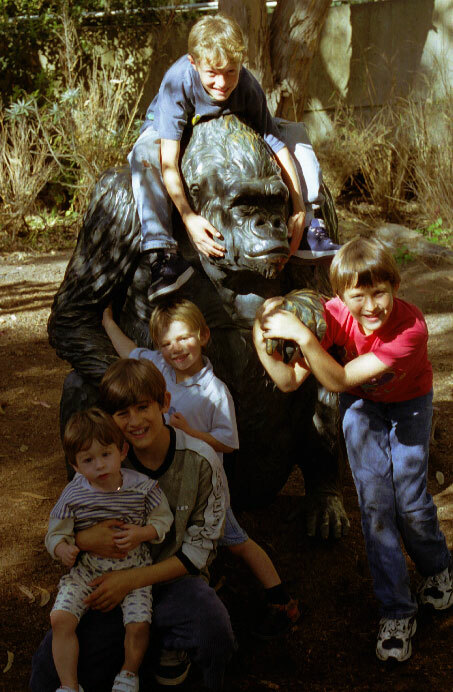 On the left, all the boys fooling around together at San Francisco Zoo in October 1999. They definitely found the baboon appealing, but we draw no conclusions from this! Click on the appropriate older child's name for pictures of him or her with Alexander and/or Charles: Thomas, Alban, Daphné and Nicholas. Below right is one from The Animal Kingdom at Disney World in August 2000, where (as you may notice!) they made a quick stop at the refreshment stand before sitting down to watch the show. 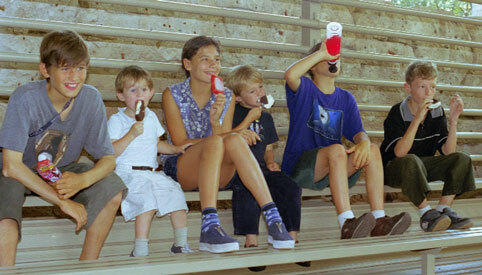 The difficulty that kept them all sitting still was eating the ice creams in the searing heat before they melted! Check out Alex holding on to Daphné. 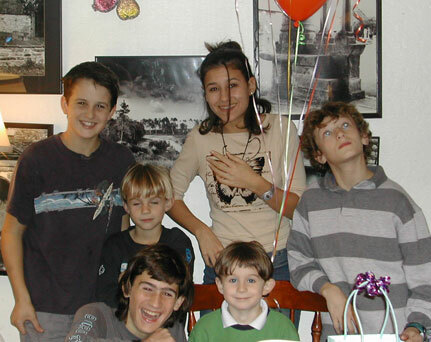 Below right is one from the breakfast room in our home in Santa Cruz on Alex's fifth birthday in 2003. This was taken when, by common accord, they decided spontaneously to make faces: fun for them, but from the photographer's point of view, you can't win them all! Of course, as the children grow older, the early complicity between the big kids and little kids has given way to something else.  They were still mutually very fond of each other, but from a distance that increased over time. 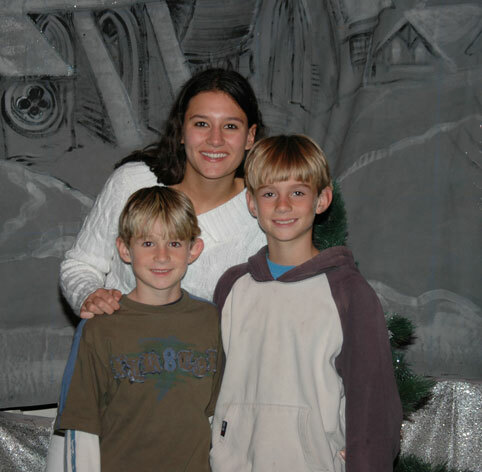 On the left, Daphné accompanied her mother, Charlie and Alex to the Dickens Fair in San Francisco before Christmas 2006. That's the kind of big kid and little kid social event which predominated as this album draws to a close. By the end of 2007, the big kids' social lives allowed little opportunity for spending time with their younger siblings, who consequently spent a lot more of their time with each other. Daphné would occasionally take the little guys bowling or to the Boardwalk, Nick would occasionally go as a supporter to one of Charlie's or Alex's soccer games, Alban would occasionally play video games with them, and Tom liked to share his musical tastes with them. But the constant rough-housing together, the constant bad influence of the older on the younger, that had evolved with the passage of time. The parents breathed a sigh of relief!